An exclusive recipe from The Tasty Page! There are certain images that flash through my mind that instantly make me smile: my boys’ happy faces, my husband opening a second bottle of rosé, a Chinese food menu, the actor Sullivan Stapleton – just to name a few. One of my favorite images is of my Lola’s, or grandmother’s, hands. Specifically, my grandmother’s hands when she was cooking. And even more specifically her hands when she made her delicious, homemade chicken fingers. The image is still clear in my mind of Lola at the stove in her house dress and tan cardigan. She would marinate strips of chicken in a bowl with the batter and I’d watch as her hand would go in the bowl and transfer the chicken – one strip at a time – to the hot pan. Shortly after those chicken strips would be turned into amazing, mouth watering beauties. I would walk in the door after school to be greeted with the smell of fried chicken fingers and say to myself, “Yes!” Lola would make a ton of chicken fingers for my sisters and me and our friends that we brought over after school. Keeping with Filipino tradition, it was always more than enough food – but at the same time it was never enough because we ate so much and so quickly. Lola was the first person that I had ever met that loved to cook, not only for her love of food and cooking, but also for the sheer joy of making the people she was cooking for so very happy. She would spend the majority of the day cooking and when we all sat down she loved seeing the looks on our faces, which couldn’t hide how delicious everything she made was. Especially when it was something we had never had before, like a Filipino noodle dish called palabok. The first time she made it I thought that it looked kind of like spaghetti, but with a bright orange-like sauce topped with shrimp, hard boiled eggs, and chicharon (pork rind) crumbs. I must have been about 11 years old and didn’t know what to make of it. I think Lola said something like, “Try it. It’s good!” And so I did and I think the smile on my face said it all. It was amazing and the flavors and texture were something that I had never experienced before. And I knew this made Lola happy. Up until I was about 10 or 11 I didn’t really know my Lola because she was living in the Philippines. She came over to the States and lived with us up until I was about 16. In that short time she introduced me to so many different and delicious flavors – and my sisters and I introduced her to Solid Gold. We’d watch it together after dinner and she especially liked seeing Men At Work perform. Lola was hip! I was too busy being a teenager (Duran Duran and my permed hair – hellooooo) to ever cook with her and learn how she made so many of her dishes. And I totally regret that. I think being a teenager, I just figured I would learn how to make them with her someday. Unfortunately, that time never came. Lola went back home to the Philippines for what I thought was a visit. I knew she was sick, but figured she be back in the States soon. She ended up passing away there. My mother, who is a phenomenal, self-taught cook, gave me Lola’s chicken finger recipe back in 2001. I scribbled it down as my mother was telling me the recipe. I’ve made it a few times since and it has the essence of Lola’s chicken fingers. But there’s something missing. I don’t know what my Lola did to make her chicken fingers taste so out of this world. Maybe it was her technique or just simply her love that made it special. But what is the same is the happy and satisfied looks on my family’s faces when I make Lola’s chicken fingers for them. The “Oh my God! This is so good!” reaction that I get from them is the same reaction anyone that’s tried Lola’s chicken fingers gave her. Even though so many years have passed, I think of her often. And when I make her chicken fingers I feel like we’re together again – watching Solid Gold. Fill a frying pan with about ½ inch of cooking oil and heat on medium heat. In a bowl mix together flour, cornstarch, baking powder, and a pinch of sugar. Add ice cubes and cold water to the bowl and stir. Add eggs and mix all ingredients well. The consistency should be like a thin pancake batter. In a separate bowl add chicken strips, salt, pepper, garlic powder, and about 2 drops (or teaspoons) of sesame oil. Mix together the chicken and seasonings and add chicken strips to the batter. Add one or two chicken strips to the oil as a test batch. Cook for about 2 minutes on each side, or until golden brown. 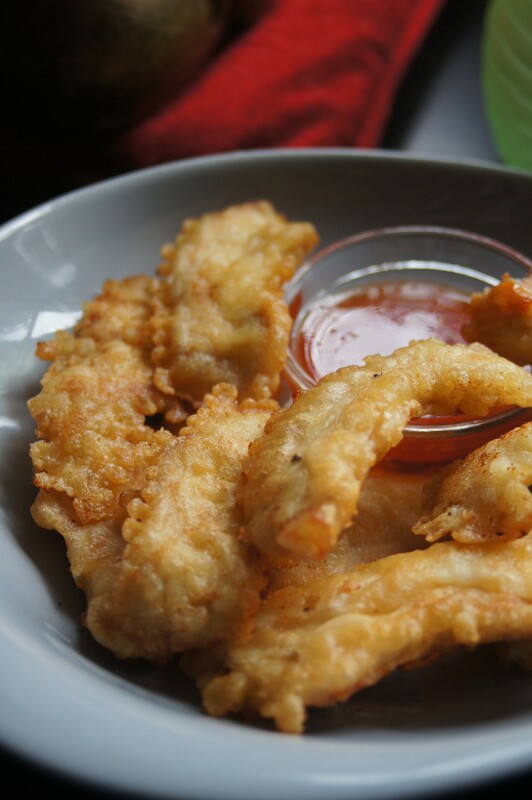 Taste the chicken fingers and add more seasonings and/or sesame oil to the batter, if needed. 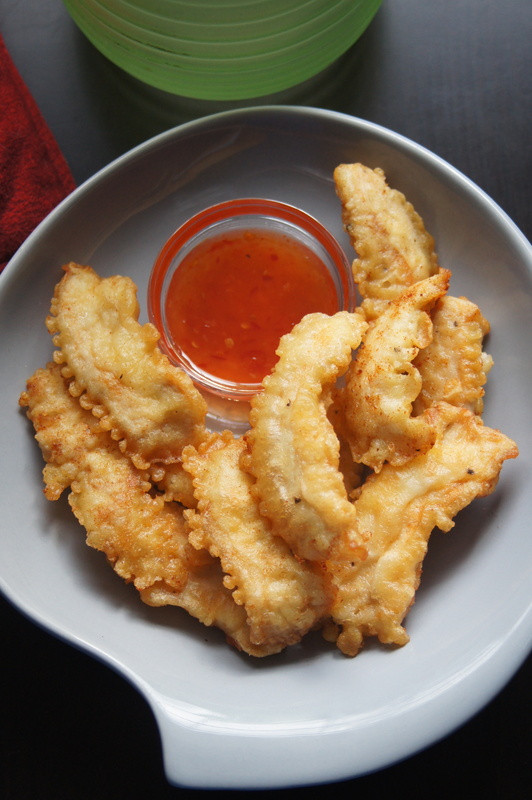 Cook the remaining chicken fingers in the pan and transfer to a paper towel-lined plate. 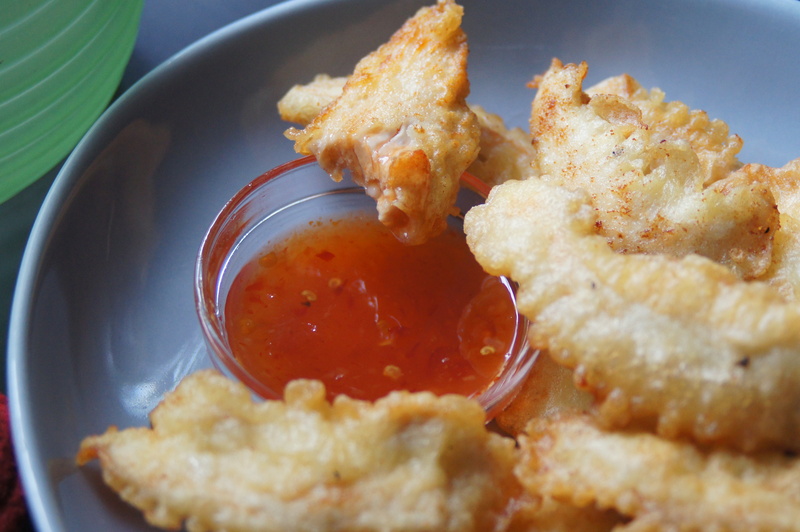 Serve with Thai chili sauce or duck sauce.